Top rated free agent Michael Chandler is going nowhere but back to the Bellator cage where he's spent the majority of his fighting career. 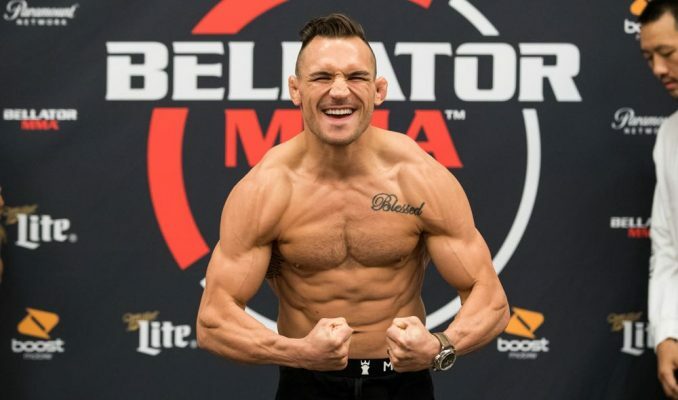 Top rated free agent Michael Chandler is going nowhere but back to the Bellator cage where he’s spent the majority of his fighting career. The former lightweight champion had been testing the free agency waters in recent weeks after his current deal with Bellator MMA had come to an end. Now Chandler has re-upped with the Viacom owned promotion for a multi-fight deal according to sources close to the negotiations. ESPN first reported the news on Wednesday. Chandler said several weeks back that Bellator definitely held a special place in his heart after essentially starting his career there after just three pro fights. “Of course I have a soft spot for Bellator and Viacom,” Chandler explained. “For Bellator and Viacom, they are the company that has helped build me since day one. It’s been a very rewarding relationship for both of us. I’ve put on the most exciting fights in Bellator history and might go down in history as the greatest Bellator fighter of all time. You’ve seen the way that we’ve grown together. It’s been nothing but awesome but it’s an interesting time for this all to be happening. Now that decision has been made with Chandler staying put with Bellator. Chandler was certainly one of the most sought after free agents in recent memory as he’s not only one of the best lightweight fighters on the planet but still very much in the prime of his career. Chandler has gone 6-1 over his past seven fights with his only loss coming thanks to a freak accident in a title fight last year where his ankle gave way in the opening moments of the first round before ultimately forcing the referee to stop the contest. In the past, Chandler has split a pair of bouts with former UFC and Bellator champion Eddie Alvarez and he has expressed interest in a trilogy to close out their rivalry in the future. Alvarez is now a free agent as well and Bellator has expressed interest in potentially bringing him back to the organization he called home for several years. While there’s no word yet on Chandler’s next fight, it’s all but certain that Bellator will want to give him the rematch with current lightweight champion Brent Primus, who won the title thanks to that freak injury in their fight last year. For now, Bellator can celebrate holding onto one of their own with Chandler signing a new deal to remain with the promotion.